The stylish design of our popular DuoBarre enables dancers and teachers to rehearse side by side and face to face. 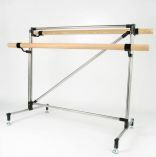 The two opposing ballet barres are fully height adjustable to suit all ages and abilities. The DuoBarre is robust yet lightweight with self-levelling feet and is constructed from high quality stainless steel with traditional wooden barres. The DuoBarre will be found in many dance studios throughout the UK. A lighter-weight ballet barre featuring a lower adjustable barre that will adjust to suit any age dancer from beginner to professional. The Studio barres can be linked together to form a continuous line or L-shape for group work. A separate "linking kit" is available to join multiple Studio Barres together.